Have you ever dreamed of owning a large coffeemaker with many high-end features? Unfortunately, these machines take up a lot of space and are typically not suited for coffee enthusiasts who have a tiny kitchen. If you are in search of a compact coffee maker that will brew delicious coffee for your family of four, the Mr. Coffee 4-Cup Programmable Coffeemaker is the right choice for you. Makes 4 Cups of Coffee: The Mr. Coffee 4-Cup Programmable Coffeemaker is great for college students who live with roommates and for small homes and offices. On/Off Indicator Light: The coffee maker also features a handy off/on button that lets you know if the machine is on or off. The saves you time for examining whether the machine is plugged in or not. ​Brewing Pause 'N Serve: In a hurry to get to work, well lucky for you because the Mr. Coffee 4-Cup Programmable Coffeemaker has a handy Pause 'N Serve feature that lets you pour a quick cup of coffee while the batch is still brewing. Dual Water Window: The coffee machine features a dual water window that shows consumers the amount of water present in the reservoir. This results in accurate filling and prevents the water from overflowing. Easy to Clean: The removable filter basket is easy to lift, which makes cleaning up a much hassle-free process. Automatic Shut Off: The coffee maker has an automatic shutoff button so you do not have to stand by the machine or constantly examine whether it has shut down or not. The machine automatically shuts down after 60 minutes of usage. This reduces the risk of accidents. ​Saves Space: The compact design of the Mr. Coffee 4-Cup Programmable Coffeemaker saves plenty of space, making it ideal for use in small homes and offices. 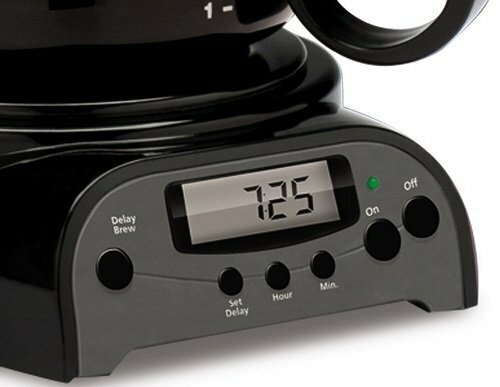 Brew Coffee in Advance: This coffee maker makes it possible for you to set brew time in advance to up to 24 hours. 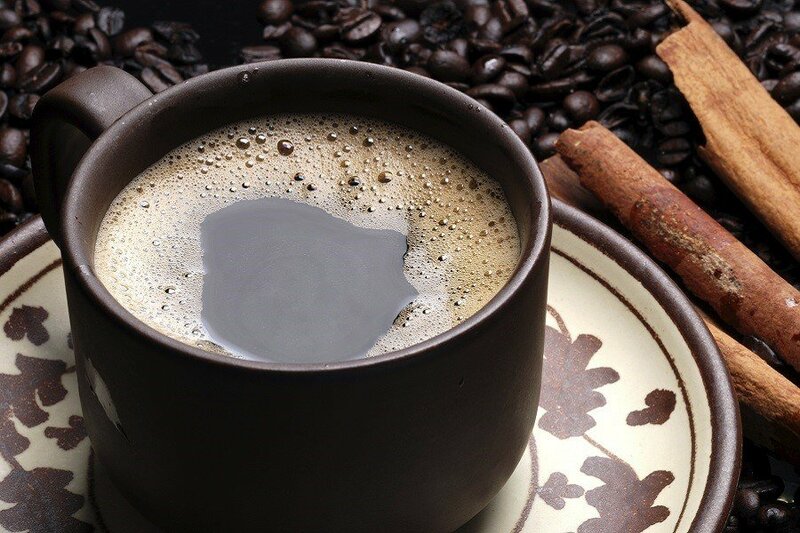 Now you can wake up to a delicious cup of fresh coffee. BPA Free: Health concerned coffee enthusiasts may be disappointed to know the Mr. Coffee 4-Cup Programmable Coffeemaker is not BPA free. Not Durable: Unfortunately, most Amazon customers complained their coffee machine did not last long. 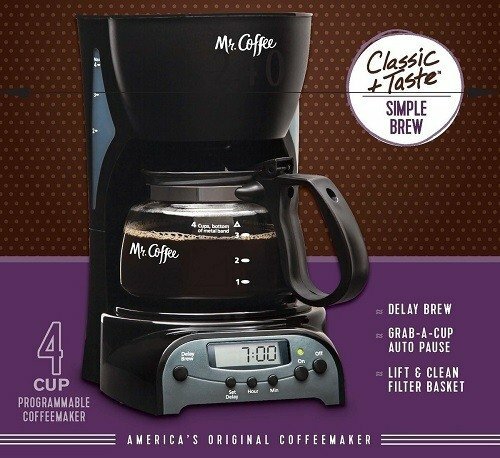 The Mr. Coffee 4-Cup Programmable Coffeemaker is available on Amazon for Check on Amazon. 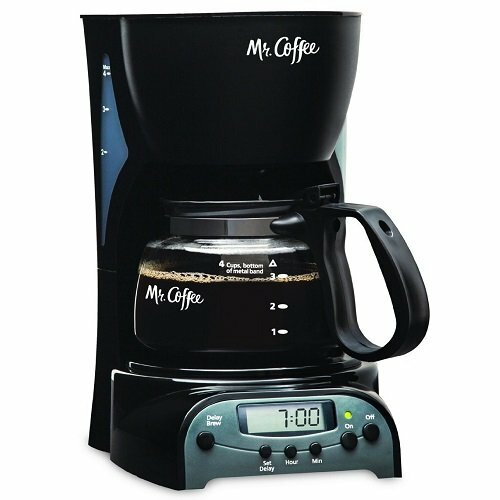 The Mr. Coffee 4-Cup Programmable Coffeemaker is generally a great little programmable coffee machine that will save you a lot of trouble in the morning. The machine is perfect for consumers who live alone or have a tiny kitchen or office.